Is this some kind of scam? How do I know that this is a legitimate program? The City’s initiative is not a scam. The program is a joint effort of the Philadelphia Court of the First Judicial District and the Division of Housing and Community Development of the City of Philadelphia, which subsidizes the SaveYourHomePhilly hotline and the housing counseling program. 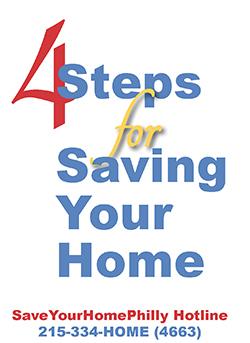 The service is provided free of charge to Philadelphia homeowners. Since its inception in 2008, the program has saved over 11,000 homes from foreclosure. My mortgage company has already refused to enter into an agreement with me that I can afford. Can this program help me get a different result? Possibly. With the help of a housing counselor, you may be able to reach an affordable arrangement that the mortgage company was not willing to offer you outside the Program. By participating in the Program you may also learn of other homeowner assistance programs that are available to you and receive more information about your legal rights. No. This program was designed to be effective with the assistance of a housing counselor. The purpose of the program is to negotiate an affordable resolution to the foreclosure, which can be done effectively with a housing counselor. You also can decide to hire an attorney later, if you decide that this Program does not work out for you. I have a private attorney helping me with my mortgage problem. Do I still need to meet with a housing counselor and attend the conciliation conference? Yes! Discuss the Program with your attorney and ask if he or she is willing to represent you at the conciliation conference. Meet with the housing counselor and have your attorney review your proposal, coordinate with the housing counselor and attend the conference. If your attorney has questions about the program, he or she can call the Hotline at 215-334-HOME (4663) for more information. What happens if I make an agreement with my mortgage company before the conference? Should I still go? Yes. If you are in an agreement but the foreclosure does not end, you will want to report the agreement to the court and make sure that the complaint that has been filed against you is dismissed or that any Sheriff Sale that may be scheduled is cancelled. If the agreement is conditional on some other steps being taken, you should also request that another conference be scheduled sometime after the date the agreement is in place so that you will have an opportunity for a conference if the agreement breaks down. I filed for bankruptcy. Am I still eligible for help? Possibly. You need to discuss this with your bankruptcy attorney. If you are in bankruptcy and there has been no order granting the mortgage company relief from the bankruptcy, you or your lawyer should notify both the court and your mortgage lender’s attorney. Also, your bankruptcy lawyer should file a document called a ”Suggestion of Bankruptcy” in the mortgage foreclosure case as soon as possible after the bankruptcy is filed. If your bankruptcy lawyer has questions about the Program, have him or her call 215-334-HOME (4663). The owner of this property is deceased, and I am an heir to the estate. Can the Program help me save this home? Yes, if an heir will occupy the property. Collect the information that shows you are an heir to the estate, and call the Hotline for an appointment with a housing counselor. You may have to probate the estate of the person who died, and if there are other heirs, you all may have to agree on who will be the new owner. A small number of low-income clients may be eligible for free legal representation to help with estate issues. If you are an heir who wishes to try to keep a property that is in foreclosure, it is very important to contact the hotline as soon as possible. There are extra steps that heirs must take in order to try to save the property from foreclosure. I am currently renting from the property owner. Do I have to move out now? SaveYourHomePhilly Hotline at 215-334-HOME (4663).